Is my Chow chow a pure breed or not? This is our new baby, Skye. He's about two mos old. Very healthy indeed. But I have few concerns about him. First of all is that, he seems tiny. I see pictures of chows about his age and they seem big. Second, he poops often. I maybe paranoid because he's our first dog. Sometimes he poops about 4 - 5x a day. Im worried if this is normal. Lastly, is that his tounge is spotted. Will it eventually darken or become solid blue black in color. I want to know your opinions if our baby is a purebred. We bought him at a petshop w/o papers because we have limited budget. Anyways, we love him to bits! And he makes us happy. This is our new baby, Skye. He's about two mos old. Very healthy indeed. But I have few concerns about him. First of all is that, he seems tiny. I see pictures of chows about his age and they seem big. Second, he poops often. I maybe paranoid because he's our first dog. Sometimes he poops about 4 - 5x a day. Im worried if this is normal. Lastly, is that his tongue is DOMINANTLY blue black in color. Spotted is not the right term. just realized it. ) Will it eventually darken or become solid blue black in color. I want to know your opinions if our baby is a purebred. We bought him at a petshop w/o papers because we have limited budget. Anyways, we love him to bits! And he makes us happy. Here are some of his pics. Last edited by Ylaartim on Sun Mar 25, 2012 4:35 pm, edited 1 time in total. Re: Is my Chow chow a pure breed or not? I can't really tell how big Skye is in the photo. He looks normal enough to me for being eight weeks old. Chow puppies of that age grow very fast, literally gaining weight overnight. I wouldn't worry too much right now if he is pooping often. He is still a very young puppy. Think about human babies. They poop a lot too. His tongue will darken, but it may remain spotted. The tongue color in itself is not an indication of whether or nor he is a purebred Chow. His overall coloring is different though, which makes me suspect he is not. Regardless, without documentation or a DNA test, it is not possible to know. Still, he is a very handsome little guy. Congratulations! This is a picture of our Milly when she was just six and a half weeks old. Her colouring looks rather like your Skye. Milly was purebred. How much does your Chow weigh exactly? It looks like a Cinnamon colored Chow. Many times a Chow of that color does not have as much pigmentation. 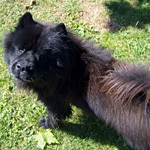 Some Chows have very dark colored tongues and gums, others more lavendar and pinkish gums. Cute Chow, none the less. PCC wrote: Hello and welcome. She is beautiful. she looks like Skye a lot. Except that her tongue is darker than my Skye. They say their color is of cinnamon. How old is Milly now? Auddymay wrote: How much does your Chow weigh exactly? It looks like a Cinnamon colored Chow. Many times a Chow of that color does not have as much pigmentation. Some Chows have very dark colored tongues and gums, others more lavendar and pinkish gums. Cute Chow, none the less. Hi. The ears both of them SHOULD be triangular in shape and ERECT or always standing up. Your pup's right ear seemed flopping down. One more indication is the temperament. A chow is sooo shy at first and it takes a minimum of 36 hours before they be relaxed or not cautious. Back to my story. At the vet, I saw two chow pups same age as my cassie and same size. However, they are not shy at all! They greet us/ and interacts. The coat though has some hairs longer or not cottony I cant tell but I can discern the difference as subtle as it is. So I asked the lady vet, and she confirmed that the pups although bought from a pet store, no papers at all and passed for a pure breed is not a pure breed. She said she suspects they had a Lhasa Apso in their bloodline. Cassie has pure black tongue at 8weeks. You can see her tongue wih a bit of pink left. On the thread Cassie My Chow at First sight. Cam Atis wrote: Hi. The ears both of them SHOULD be triangular in shape and ERECT or always standing up. Your pup's right ear seemed flopping down. One more indication is the temperament. A chow is sooo shy at first and it takes a minimum of 36 hours before they be relaxed or not cautious. Thanks for your reply. the owner of the pet store where we got Skye, said that his right ear will stand up eventually because he's still a puppy. about Skye's temperament, he was shy at first. On our way home, he's very quiet. Just lying on his belly, without a sound or move. And when we got home, it's the same scenario which got me worried at first. same. There all going to have there own personalty. Whats important is you love him and he will love you. Been a few more months - has the ear perked up? The coloring and size are natural - my Chow Trooper is now 4 yrs. and he weighs in at 48-52 lbs. fluctuating at times. He is on the smaller end of scale and his predecessor Bandit was around the 50 lb. mark too. Not sure on the spotty tongue - could still be pure-bred but to a kennel club with a 'fault'. Has his tongue changed since your last post.? Skye have rested in peace many weeks ago. YOu can find a thread somewhere in the general section as to the cause of his demise. me too. i have the same concern. i got this from an online seller. 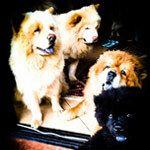 she has many chow chow puppies for breeding although they dont have any papers. they said it is pure. their pictures looks legitimate but when i get to see the babies i was kida disappointed, they said the ones in the pic were also sold. had to drive miles for the meet up and then only to be told they would get there in 4 more hours. i said i wanted a female and we were so clear on that and then they brought two males.since all of the inconveniences ive gone through, the time and the effort, and the pup was not that bad looking though not what i expected.i decided ill just get it. pls tell me what you think of his pics. i highly doubt even more after searching some more info on the net.its snout is long i think, its not that fluffy, the face is too smooth i guess and one said the ears should be up and its also long. and yeah, he is not that aloof.i dont know if it should be considered a basis really. me too. i have the same concern. i got this from an online seller. Rover, you kind of just answered your own question it sounds like. If a breeder cannot show you written proof of pedigree for the puppy, resgistered with a reputable kennel club like the AKC, Canadian Kennel Club, or UKC *( not just the parents), but the puppy also, then the dog is not pure... Period! no matter what a breeder tells you and no matter what anyone else tells you. No papers = dog is not considered a purebred. In fact in some countries, this is a law. In essence generally speaking you cannot purchase a quality dog on line either. These are puppy millers and back yard breeders that you are supporting, which is very undesirable. So that you know however, many chows out there have entirely overdone heads. A dog with a too short nose, is a dog that cannot breathe. If you resource chows from 80 years ago, they didn't have "short noses", so that is not necessarily a good guideline to go after. The standard calls for the length to be equivalent as the width, ( as your puppy shows in the pictures), but certainly not so much as to interfere with normal respiration. As far as the coat, well, perhaps this is a smooth chow and not a full coated chow. Looks like a cute puppy. Just offer it love, an education, respect and all the trimmings and it will most likely grow up into a fine companion. When you are in the market for a future chow, seek out breeders of merit. They generally have websites, but don't sell their puppies online like shoes or hats. Contact your local chow chow club to locate a breeder who has signed and agreed to a code of ethics and who does produce pure chows and can prove it to you in writing! They can also prove clear hips, good eyes, and good health. They do that in writing too. rover wrote: their pictures looks legitimate but when i get to see the babies i was kida disappointed, they said the ones in the pic were also sold. Uhm, they lied to you. God knows where they stole the pictures, probably from some really good breeder's website! As you said, that's how they got you there! Where did you buy him? Out of the trunk of a car? It sounds like it! The puppies should always be on the premises, and not four hours away. Your dog is definitely not a purebreed Chow, so if that was important to you, then that's unfortunate! Half retriever, I would say! Like Merlin said, the only thing you can do now is to love and cherish your little mixed-breed boy. He is a very cute guy, so I wouldn't mind too much that he isn't a pure breed. I go with Sarahloo and the half retriever genes. For a cream Chow his nose is too black and it looks as if the ears are not going to go up, they are too long already. 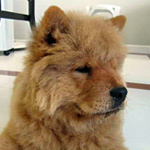 But a goldy/chow will be a perfect companion too. He might not be as edgy as the pure chows when it comes to obedience. I like him, he looks intelligent and of course super cute. hello same problem here! I have a 4 months old puppy and also worries if its a pure one or not. He doesn't have any fur or hair on his tummy.. only his skin at all.